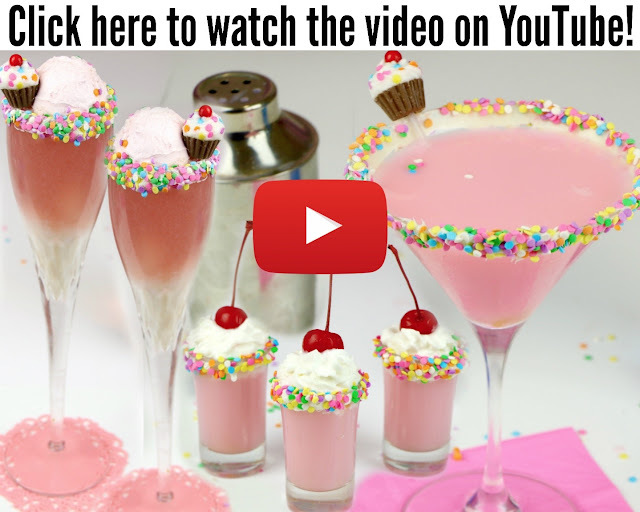 Cocktails that taste like a birthday party in a glass! 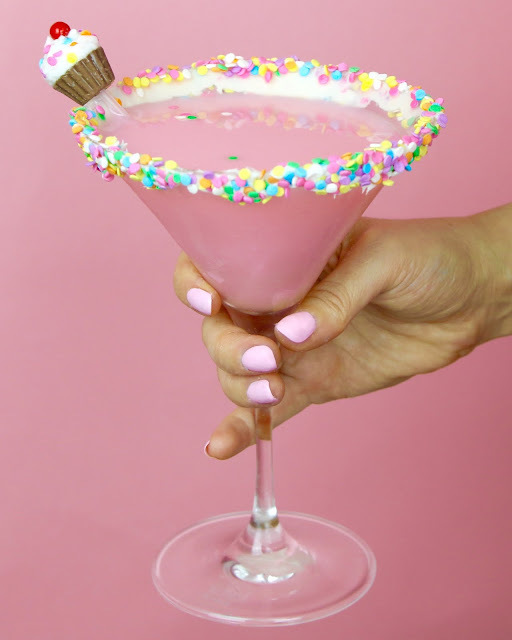 Imagine if you could have your cake and drink it too, with sweet funfetti cupcake flavored martinis, mimosas or shots, all finished off with frosting and rainbow sprinkles. 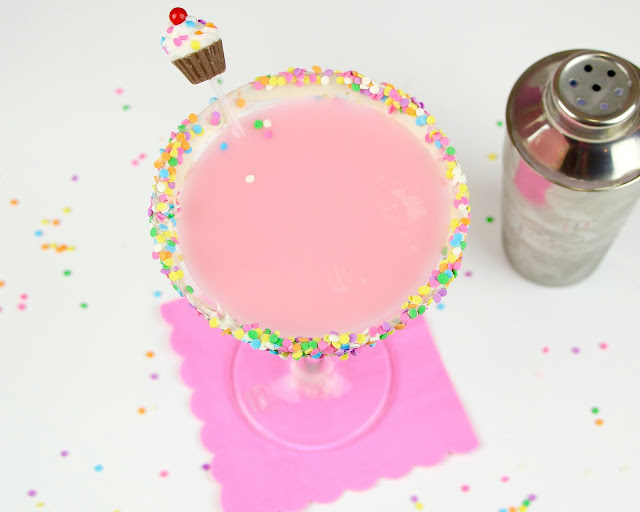 Basically, if I were throwing a party, there is nothing I would rather serve than pink funfetti-ified cocktail concoctions that taste just like birthday cake. Why they don't actually serve these at every bar or restaurant, I have no idea, because these are pretty much the best thing to happen to cocktails. 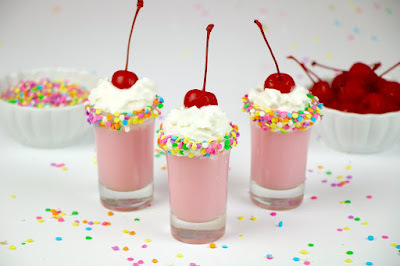 So, since it's almost New Years, I wanted to show you guys some super fun adult beverage ideas to celebrate with, and if you're not of legal drinking age, I'm going to show you how you can make non-alcoholic "Mocktail" versions too! 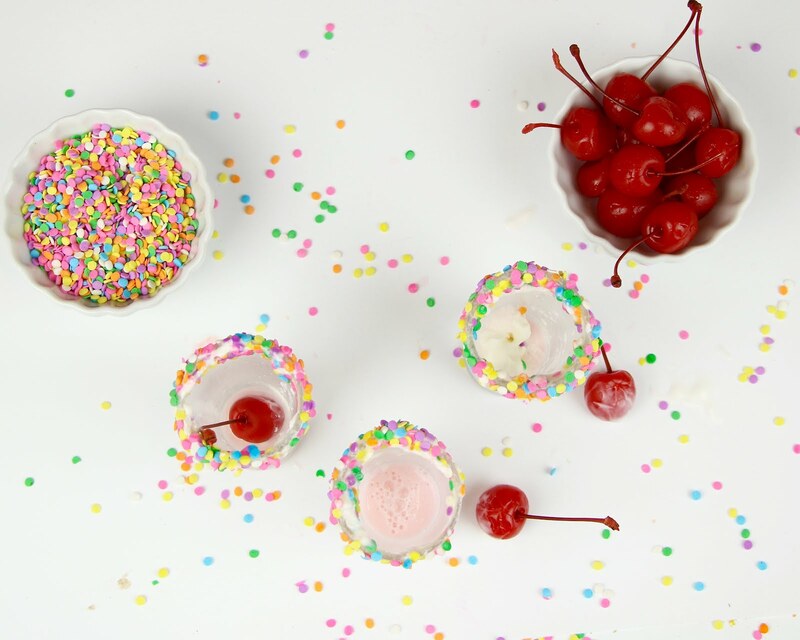 The next time you're throwing a party, or having a girls night in, or have a special celebration, your friends are going to go nuts over these. The best part is, you can make the rimmed glasses and mini cupcakes in advance, and then, just fill them up right before you're ready to serve, for a perfect party surprise. * For a non-alcoholic version, replace vodka, white chocolate liqueur and amaretto with 3T of vanilla cream soda and 2T almond milk. 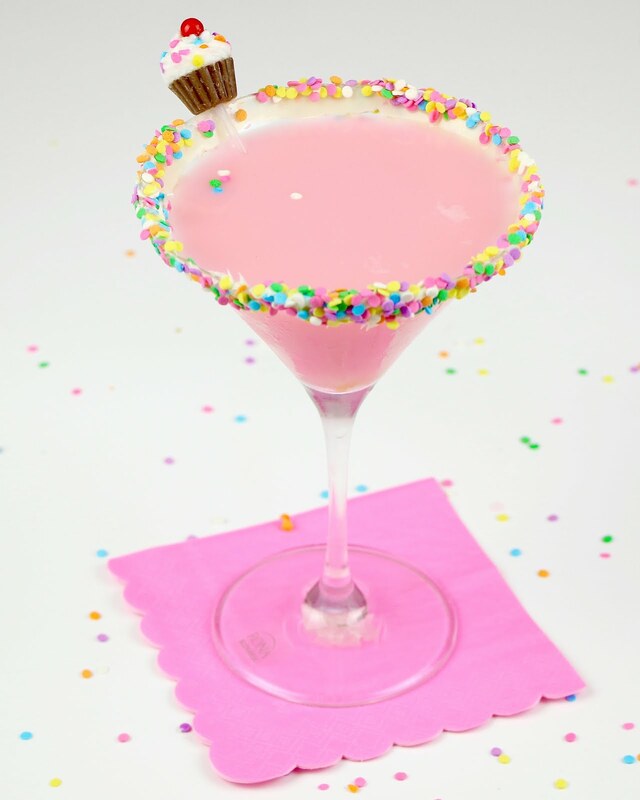 Spread frosting around the rim of a martini glass and roll in sprinkles; set aside. In a cocktail shaker filled with ice (or a large measuring cup or glass), combine vodka, white chocolate liqueur, amaretto, cream and a drop of pink food coloring. Shake (or stir together) and pour into your prepared martini glass. Add mini cupcake stirrer, if desired. Top a mini peanut butter cup with a little swirl of frosting and sprinkles. Slide on to the top of a straw or cocktail stirrer. Add a spice drop or candy on the bottom of the stirrer to weigh it down. Add to glass and serve. Dip the rim of a champagne flute into frosting and roll in sprinkles; set aside. 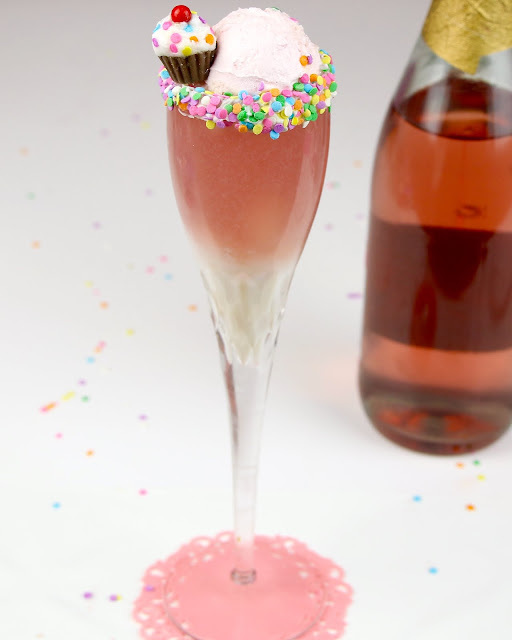 Add a shot of vodka, a shot of white chocolate liqueur and a scoop of ice cream to the glass. 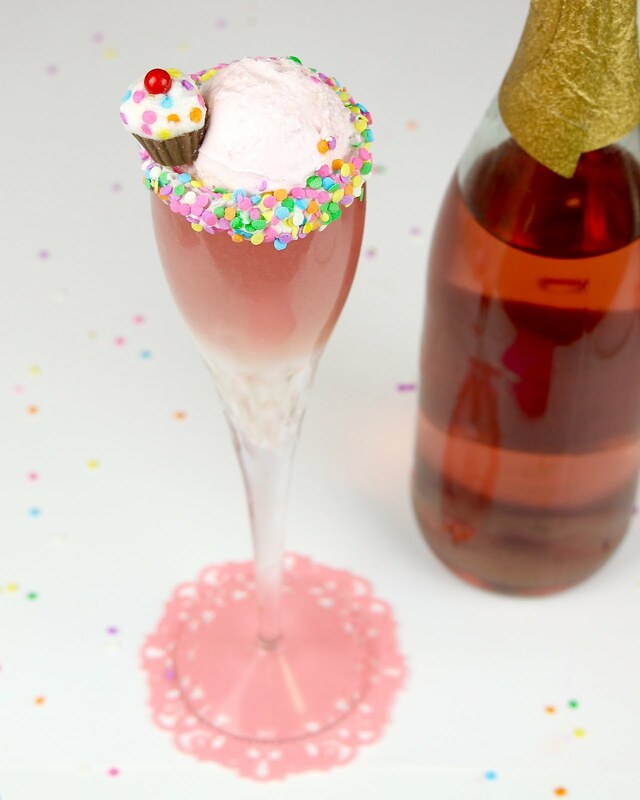 Top off glass with sparkling rosé. Add mini cupcake garnish, if desired. Top a mini peanut butter cup with a little swirl of frosting and sprinkles. Slide on to the top of a straw or cocktail stirrer. Add a spice drop or candy on the bottom of the stirrer to weigh it down. Add to glass and serve. 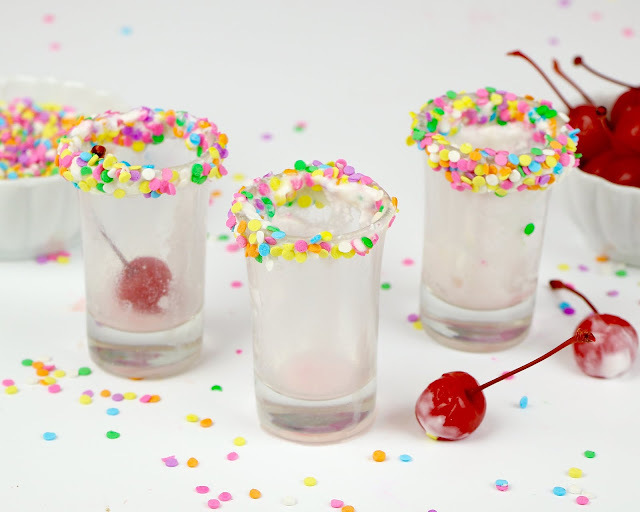 Dip the rim of 3 shot glasses into frosting and roll in sprinkles; set aside. 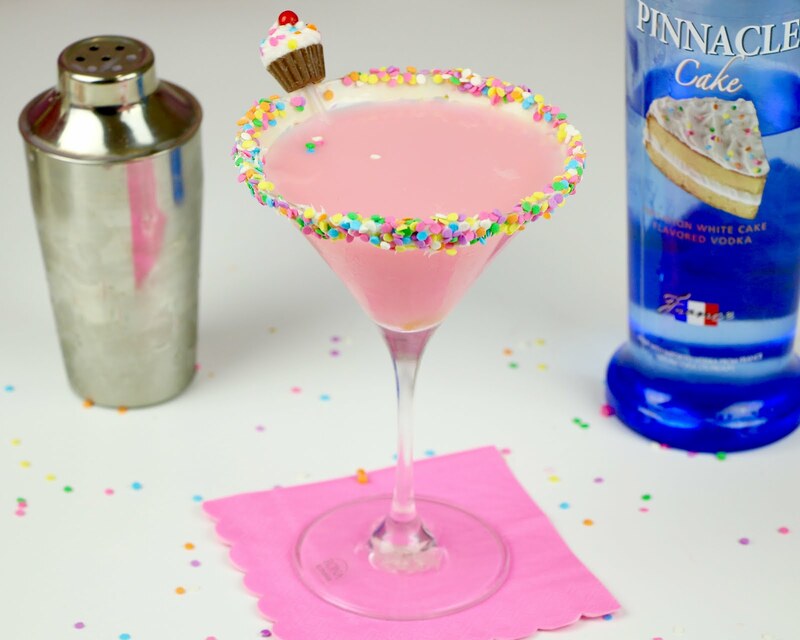 In a cocktail shaker filled with ice (or a large measuring cup or glass), combine melted ice cream and vodka. Shake (or stir together) and pour into your prepared shot glasses. 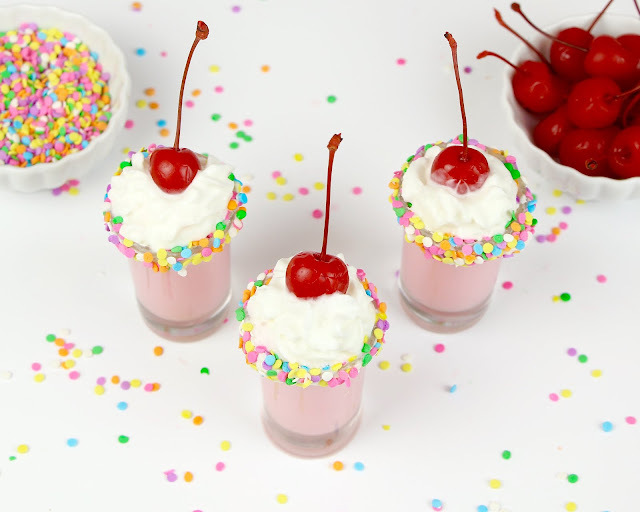 Top with whipped cream and a cherry. Serve immediately.